RENEGADE is a highly-effective demulsifier that dramatically simplifies the processing of Drilling Mud waste streams. Used at low temperatures and in low concentrations, it separates the homogeneous mix of oil, water and solids, allowing for the simpler removal of oil for recycling and the settling out of solids for more efficient waste-water treatment. RENEGADE is formulated to lower oil-water solubility at low temperatures, splitting Drilling Mud into two or three distinct layers – oil, water and solids. Oil at the surface can be reclaimed for recycling. Solids settle, separating from water. If you’d like to learn more about RENEGADE, you can download a copy of our latest sell sheet. The carefully engineered formula uses environmentally acceptable chemicals to separate the constituent elements of Drilling Mud streams quickly at low temperatures. Its effective usage concentration is low, making it longer-lasting and more cost-efficient. RENEGADE removes more oil from water at lower temperatures, ensuring that the quality of the reclaimed oil is high while also helping to keep the overall treatment costs down. The fast-acting formula separates oil from water in less than 24 hours, dramatically reducing the time and cost spent readying the effluent for entry to the waste water treatment system. 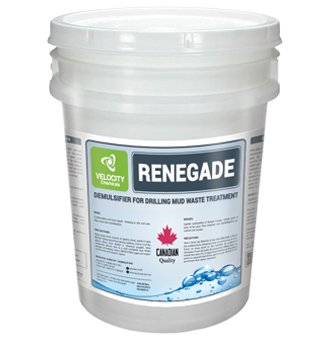 RENEGADE is now available directly from Velocity Chemicals, with orders shipped to anywhere in Canada and the US within 24 hours. To order, call one of our specialists today at toll-free 1-888-963-9499.